Like the fleeting blossom of Jacaranda trees in spring, faith in the government of Zimbabwe’s president, Emmerson Mnangagwa, has waned, following another round of state violence towards unarmed citizens. A Harare woman wounded in the leg by a close-range gunshot from a soldier’s gun is ferried in a wheelbarrow to seek medical help. Elsewhere in the capital, a young footballer is killed for standing outside his home – his sole crime was being in the wrong place at the wrong time. These days, on the streets of Harare, an unnatural silence and fear have displaced the wild cheers of celebration that accompanied the 2017 resignation of Robert Mugabe as president. Hope has turned into mourning in cities around the country, where a general strike opposing Mnangagwa’s 150% fuel price hike turned bloody. At least 12 unarmed civilians have been killed and hundreds injured in a brutal crackdown led by the military. Our nation has had its moment in the sun – and is now trapped in a cycle of terror and unrest. Armed soldiers are a fixture on the streets, manning roadblocks and fuel stations. When you board a public bus, a soldier wielding a machine gun stands lifelessly next to the conductor. The government resorting to military control of civilian life is the clearest sign of failed leadership by Mugabe’s successors. It’s clear that until the military is removed from civilian spaces, Zimbabwe will only plunge into deeper political and economic misery. The involvement of the military in civilian politics is not new. As far back as 1975, as the country struggled for its independence, young military officers at the main Zimbabwe African National Liberation Army (Zanla) training camp wrote a communique that led to the removal of Reverend Ndabaningi Sithole as leader of the Zimbabwe African National Union (Zanu) liberation party. 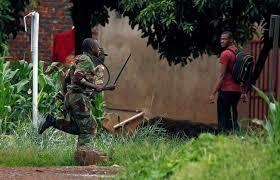 Sithole had helped found Zanu in 1963, but the military manoeuvred to replace him with Mugabe. This interference in politics did not end after independence in 1980. In 2008, the then commander of the defence forces, General Constantino Chiwenga, stated that he would not salute any political leader who did not have liberation war credentials – echoing the same call by his predecessor, General Vitalis Zvinavashe. The military played a key role in violence during the elections of 2008 and 2002. While the involvement of the military in civilian politics was more constrained during Mugabe’s authoritarian tenure, even the wily president eventually lost control – he was forced out of office at the hands of the military in November 2017. Since then, the military has felt more emboldened than ever in playing a stronger role in social, political and economic affairs. Retired officers have been appointed to key cabinet, party and state positions, including the vice-presidency, Ministry of Agriculture, the Ministry of Foreign Affairs and the National Parks Authority. A popular claim, in the era of rising authoritarianism, is that “strongman” leadership and militaristic discipline is necessary for economic reforms and a stable environment. But as we are seeing in Zimbabwe, the reality is that strong military men often lack the required governing expertise, resorting to heavy-handed tactics instead. The military is also standing in the way of citizens’ fundamental freedoms – and it prevents civilian politicians and the young, who did not participate in the 1970s liberation war, from truly taking part in the political process. The Zanu-PF leadership has consistently rehashed liberation narratives to ward off any alternative leadership emerging – meanwhile it fails to develop new political and economic programmes to actually help Zimbabwe. Until this system changes, Zimbabwe will continue to be deprived of the wealth of skills its varied citizens have to offer in rebuilding the country. Restricting political options to those who participated in the war of independence and those who find favour with them, has stifled the emergence of any new vision to take the nation forward. The task of removing the military from civilian and political life is not going to be easy. Mnangagwa’s party and the military have been intertwined since the 1970s, while he only came to power because of the military’s support. But make no mistake about it: Mnangagwa is the commander-in-chief – only he can lawfully deploy soldiers on to the street or make them step down. The buck stops with Mnangagwa when it comes to blame for the ongoing violence. The wounds afflicting injured survivors may one day heal. But our politics will remain toxic as long as the military is at the centre of it. Any dialogue about the future must involve concerted, concrete plans to demilitarise Zimbabwean politics. Only then can the promise of a new Zimbabwe truly blossom.